June, 1995. Bal Aficain hosted its annual gala fundraiser at the Detroit Institute of Arts. The group’s purpose was to support the museum’s efforts to bring African heritage and culture to the worldwide community. Something spectacularly out of the ordinary was about to happen: The Queen of Soul was to perform an exclusive patron concert at the event. As official photographer, I was tasked with taking shots of the reception, speakers, concert and afterglow. 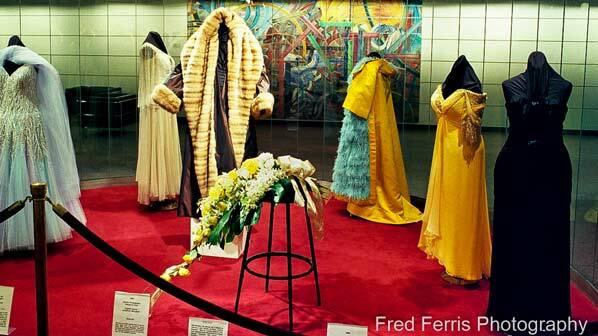 And one more thing: the event handlers were to tell me when to leave the reception (Rivera Court) and go downstairs to an area where Ms. Franklin’s gowns – her one-of-a-kind gowns worn at her performances – were on public display. I was to meet her there and take a few photos of her with the gowns. The reception got underway. I had been shooting for about an hour when a palpable shift occurred in my body. A compelling feeling came over me to GO NOW. No one had given a signal. The organizers were nowhere in sight. Regardless, I was obedient and moved to the lower level where the gowns were displayed. I was all alone and proceeded to take test shots of the gowns, when I heard a door open and close behind me. 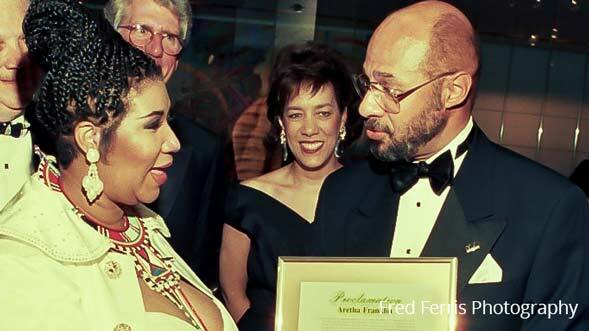 I knew Ms. Franklin’s lead photographer and once asked what it was like to photograph her. He replied, “She has to ‘like’ you before any photos are taken.” That’s all he said. 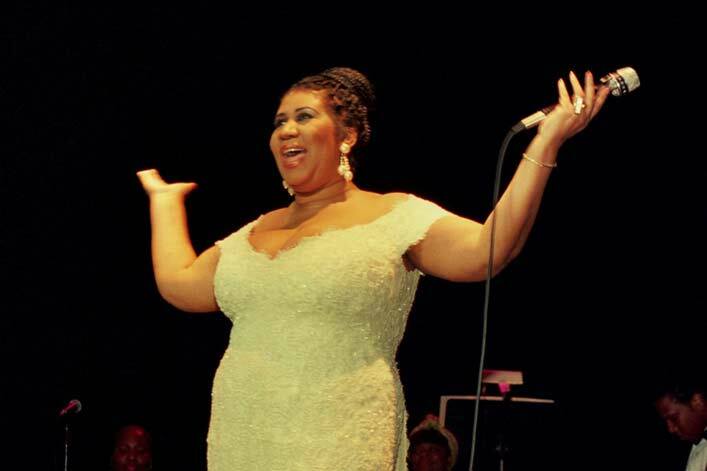 I turned around and there was the Queen of Soul, Aretha Franklin. No security. No handlers. No museum personnel. JUST THE TWO OF US. For a moment I lost it. Then I recovered enough to stumble out my name and the assignment. She enveloped me with a big smile, called me “honey” and wanted to know which gowns to pose with. I replied to select one or two would be fine. Maybe five minutes had passed when there was an explosion of people. We went from the two of us to 200. Everyone from the reception came running into the area. Mayor Archer gave welcoming remarks and Proclamation. Other dignitaries followed with their remarks. Then pictures pictures pictures with the Queen. I kept shooting, loading film and shooting. Then it was over. They announced The Queen needed to retire to meditate prior to the concert. The place was empty. I was all alone. Fell down on my knees and gave thanks and praise.